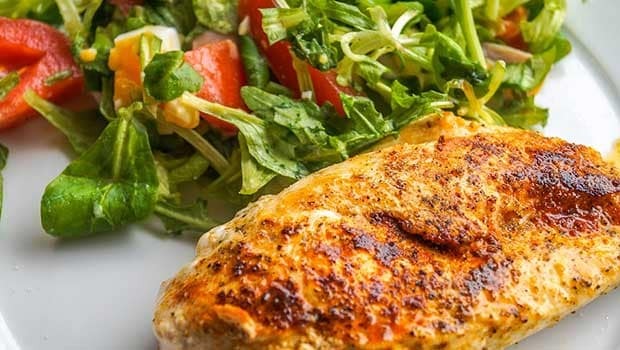 Chicken Recipes for Dinner - Growing up, 'chicken dinner' always meant a special meal, something the kids looked forward to. Probably that's how the "winner winner chicken dinner" saying came about. Chicken Tikkas, Chicken Dum Biryani, Murgh Mussalam, Malai Tikka, Chilli Chicken and Manchurian are all reminiscent of cherished family dinners. For the moms too, cooking chicken wasn't really a tedious task. It took only about a few minutes to rustle up delicious curries, stir-fries, roasts and bakes, and have every member of the family gleaming with delight. 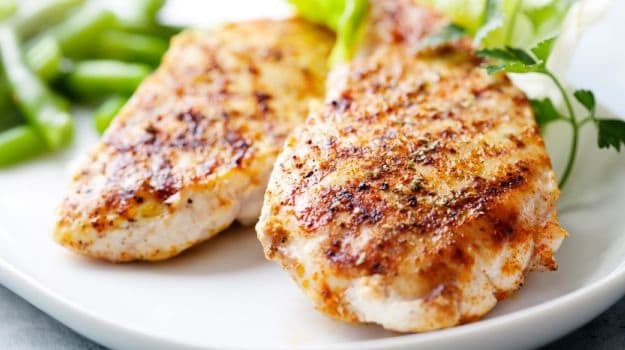 Being in the healthier category of meats, chicken is a preferred choice for dinner meals at home. 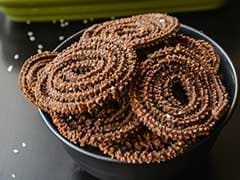 It can be cooked in a number of ways (baked, braised, steamed, boiled, roasted, curried) and the best part is that it effortlessly blends in with different kinds of ingredients and spices. 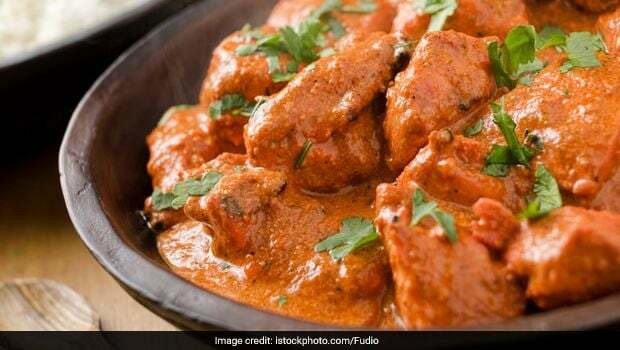 While in India, chicken curry is among the most loved dinner dishes, which is either teamed with piping hot steamed rice or soft rotis, other preparations like chicken pie, chicken roast, baked chicken and grilled chicken make way to the table for a wholesome meal, especially for those who are watching their weight. 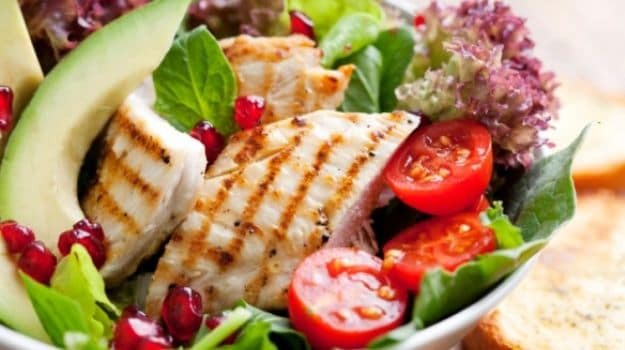 In the markets these days, there are different cuts of chicken to suit your fancy - boneless, breasts, thighs, wings, drumsticks, etc that you can use each type to prepare various dishes at home. To save time, you can do the prep the night before - marinate the chicken pieces and then quickly cook them before dinnertime. 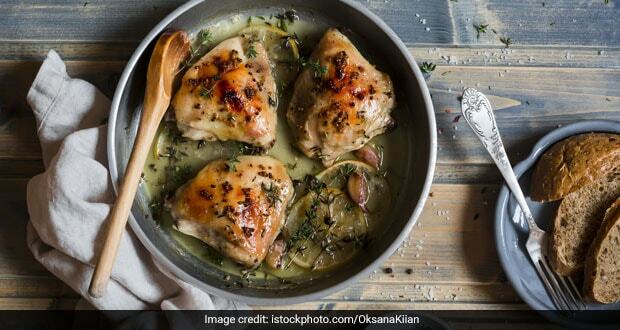 If you are looking for ways to spruce up dinner meals at home besides the regular curries, we present our 10 best chicken dinner recipes to help you out. From Indian-Style Baked Chicken to Chicken Tagine and Enchiladas, we bring you lip-smacking recipes from across the globe that are guaranteed to make dinnertime at home the favourite part of the day. Chicken marinated in home-made spice powder and green paste. A perfect dinner recipe to cook which is easy and quick. 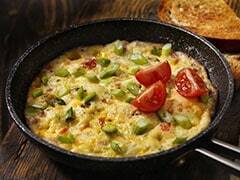 Grilled to perfection and served with a fresh salsa of grapes, spring onion and cherry tomatoes. 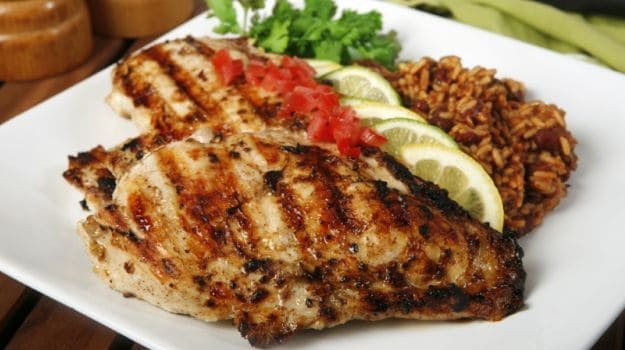 Grilled Chicken Escalope with Fresh Salsa has juicy flavours grilled with perfection inside the chicken. Salsa dip copliments and completes the dish. Chicken breast stuffed with a creamy mascarpone cheese filling. Cooked in the oven or barbecued and served with a white wine sauce. Who wouldn't love a cheesy delight for dinner? A tasty chicken mascarpone recipe filled with cheese and simmered with chilli flakes and salt! Dig in this healthy couscous with the goodness of pomegranate and mint. Served with an easy to make chicken tagine cooked with preserved lemons, saffron and olives. 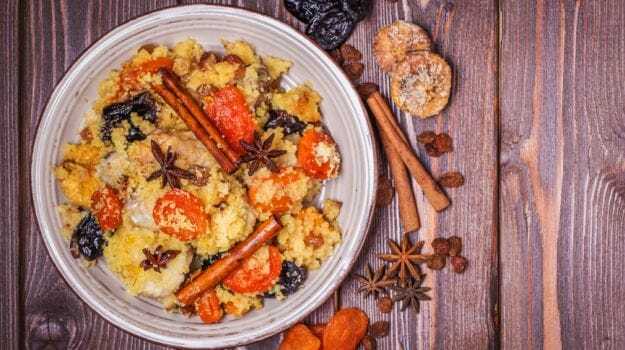 A dish full of healthy ingredients such as mint, pomegranate, saffron and olives, Chicken Tagine and Couscous is a great dinner recipe. Tender chunks of chicken and bacon tossed in the flavors of garlic and white wine. Full of flavor and absolutely delicious! 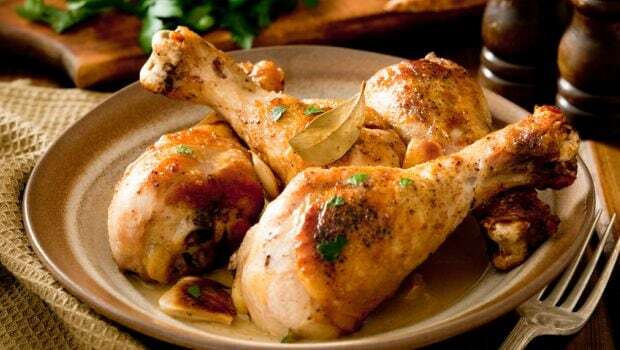 Braised in white wine and garlic, chicken is cooked to perfection in this easy Chicken in white wine recipe. Grilled Herb Chicken Breast with Honey and Asparagus is a juicy, tangy and sweet grilled chicken recipe that would be a delight to have on the dinner table. A delicious baked chicken recipe with a yogurt-based marinade. You can spice it up for more bold flavours. 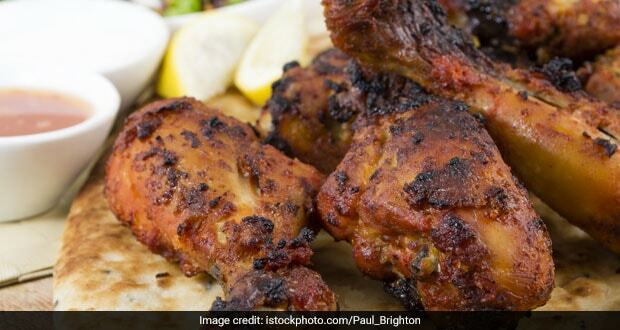 Indian style baked chicken or tandoori chicken is a popular spicy dish and would spruce up the dinner menu when paired with some lemon and coriander chutney. A creamy chicken curry with coconut milk and mild spices, this chicken recipe is a popular one from South India and is great dinner option when paired with rice or naan. Coconut chicken curry is comforting and pleasurable at once making it a perfect dinner parties. 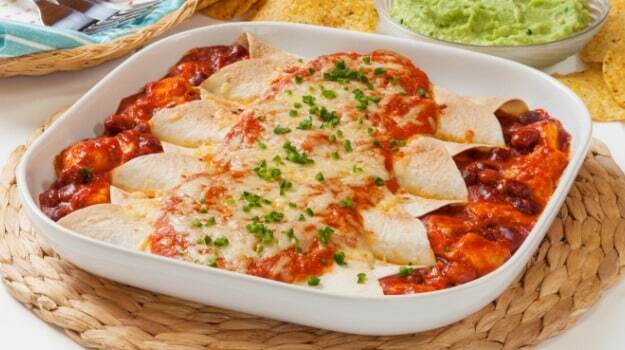 A popular Tex Mex recipe - rolled tortillas stuffed with creamy, cheesy chicken filling, drizzled with a tangy tomato sauce and baked golden. Chicken Enchiladas are delicious baked rolls that would be great for a kids party as well as for a movie night with friends. Dig into this cheesy, spicy chicken! Coated with a Parmesan cheese batter, chicken breast is fried crisp and served with freshly home-made tomato chutney. Spicy Parmesan Chicken is a delectable dinner recipe to cook at home. Tender chicken mingled with a creamy coconut sauce and topped with breadcrumbs. Chicken Crumble is the perfect supper recipe! 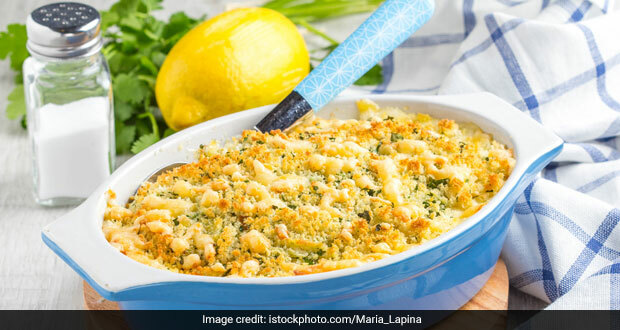 A filling, wholesome meal, chicken crumble is a tangy chicken recipe filled with the goodness of olive oil. A delight of a dish, half roast chicken is the perfect chicken recipe for a dinner party! Oozing with the aromatic spices and a delicious beer mix poured over, this is a treat to your taste buds. 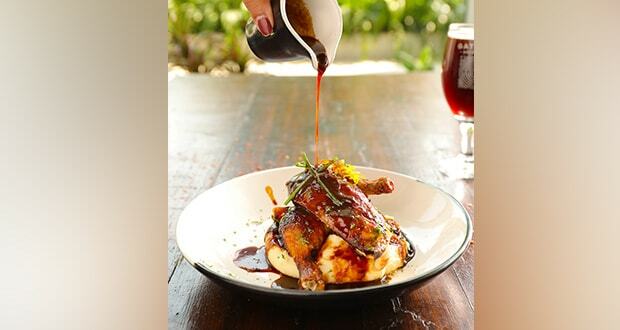 The specialty of Half roast Chicken is the distinct flavour of the beer mix called Dunkelweizen that is poured over it in generous amounts. The classic Indian chicken curry recipe! 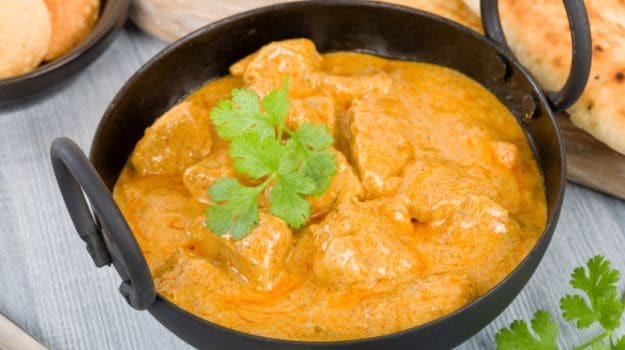 Butter Chicken is the heart and soul of North Indian non-vegetarian foodie. Loaded with spices and butter, chicken is cooked to perfection making sure you doesn't resist a second or even third serving. Who wouldn't love a bowl full of butter chicken that is served hot, brimming with aromatic spices and loaded with butter? Saving the best for the last! 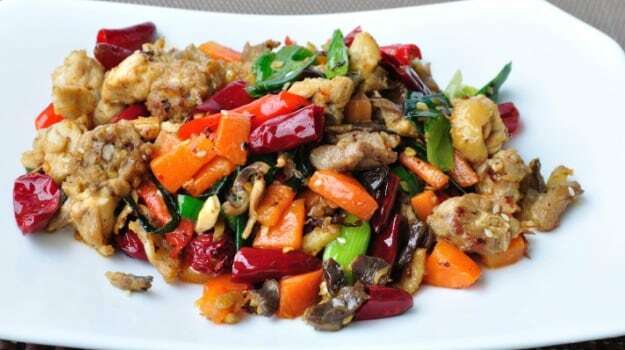 Chicken sauteed with a myriad of chillies and fiery spices. Chilli Chicken is one of the most popular Indo-Chinese dish that you can savour both as a snack or main course. An easy recipe to cook at home. Full of juicy and tender chicken chunks coated with chillies and spices, chilli chicken is loved by kids and adults alike! Now go ahead and host your own dinner party with these absolutely delectable chicken dishes from around the world.